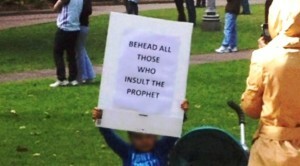 A Muslim child is holding a sign advocating beheading for those who insult Islam. More than 800 police officers in Sydney, Australia launched raids on homes of suspect Islamic terrorists. At least 15 Islamists were arrested in a plot to behead a member of the public in Sydney. The Islamic State terrorists planned on kidnapping a member of the public at random, drape them in an ISIS flag and videotape the beheading. Police have also conducted other raids in different cities to arrest Islamic terrorists. Australian terrorists have been accused of helping recruit, facilitate and fund terrorists to travel to Syria to engage in hostile actions. In 2012, Muslims held a street protest in New South Wales that included children holding flags calling for the beheading of anyone who insults Islam. The protest, of course, turned violent and six police and 17 civilians were injured. Read more on the Islamic Jihad taking place down under: ISIS Planned Beheading of Australian… in Australia | FrontPage Magazine; Children with beheading signs an outrage, says Scipione; Anti-terror operation in Sydney and Brisbane ‘thwarted’ beheading plot – ABC News (Australian Broadcasting Corporation).